HONG KONG, October 10, 2018 – WiWU, the experienced team behind the popular OnePack backpack, announced the Kickstarter launch of Switch – a totally new transformable backpack design. It can easily switch into four useful modes with detachable straps and easy access: a shoulder bag, handbag, messenger bag and also the backpack. 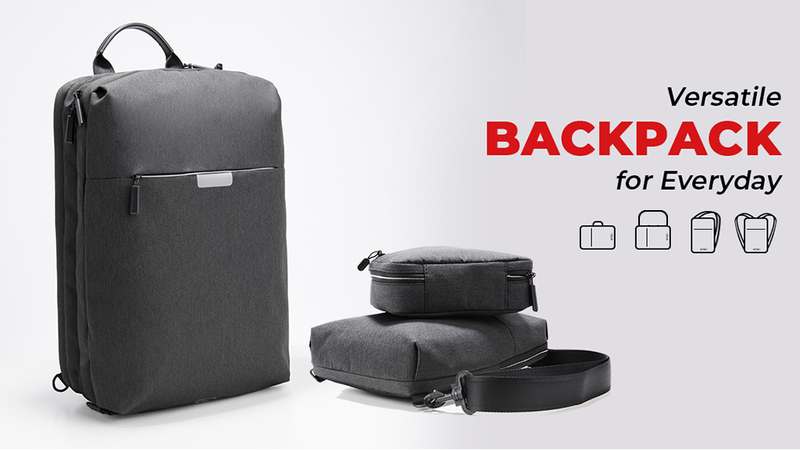 This 4-in-1 carry-all for school, business, travel and adventures combine the best features of suitcases and backpacks that make it the perfect storage system for modern lifestyles. It is available now with special rewards for early adopters on Kickstarter. The Switch has a 22-liter capacity that uses well-placed dividers, mesh pockets and access points for efficient storage for adventure or travel. The dividers provide separate spaces for clothing, shoes, laptop computer, notebooks, mobile devices and daily essentials. Its specially designed straps are comfortable and the carry handles distribute weight perfectly for light or heavy loads. It’s compact enough for daily use yet easily expands for 2-3 day trips. From our previous successful backpack designs, we knew that people need smart solutions to a variety of daily applications. Switch's 4-in-1 design makes it perfect for any activity, commute or travel. It consolidates the best features into a transformable design that does it all. “From our previous successful backpack designs, we knew that people need smart solutions to a variety of daily applications. Switch’s 4-in-1 design makes it perfect for any activity, commute or travel. It consolidates the best features into a transformable design that does it all.” Chun Hang, chief engineer of WiWU Designs. The switch uses durable fabric that resists stains and is rain resistant for inclement weather, the zippers are top-quality no-snag design and the back of the pack has a unique roller bag sleeve that fits over a roller-style suitcase for easy transport when used in conjunction with larger suitcases when traveling. Stylish, compact and easy to carry, the Switch campaign has now launched with introductory pricing, deals for early adopters and limited special discounts.